Dana Andrews, film actor and past president of the Screen Actors Guild. Ed Asner, film, television, stage, and voice actor, past president of SAG. Smiley Burnette, country music performer and a comedic actor. Alex Trebek, game show host. HAIM, Band consisting of 3 sisters, Este, Danielle and Alana Haim. BBC Sound of 2013, Album: Days are Gone. 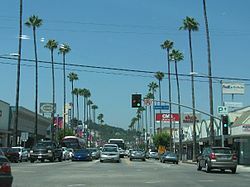 Almost half of Studio City residents aged 25 and older (49.4%) had earned a four-year degree by 2000, a high percentage for both the city and the county. The percentages of those residents with a master's degree was also high for the county. Harvard-Westlake School, private, grades 10-12, 3700 Coldwater Canyon. Campbell Hall School, private K-12, 4533 Laurel Canyon Boulevard, Founded in 1944 by Alexander Campbell, the school is home to approximately a thousand students from kindergarten through high school. Bridges Academy, private, 3921 Laurel Canyon Boulevard. It is a grade 5-12 middle and college preparatory high school dedicated to educating students who are twice exceptional, or "2e," (gifted and highly gifted with learning disabilities). Los Angeles Public Library operates the Studio City branch. ↑ Schodowski, Chuck (2009). Tom Feren, ed. Big Chuck! : My Favorite Stories from 47 Years on Cleveland TV. Gray & Company. p. 124. ISBN 9781598510560. Retrieved 16 April 2013. ↑ McKay, James (2010). Dana Andrews: the face of noir. McFarland. p. 22. ISBN 978-0-7864-4614-8. ↑ Bill Newcott (May 26, 2009). "Bill Newcott on "Up"". Movies for Grownups. AARP. Retrieved 20 October 2011. ↑ Lauren Beale (April 16, 2011). "Jeff Probst buys Gene Autry estate in Studio City". Los Angeles Times. Retrieved 20 October 2011. ↑ 5.0 5.1 Borges, Eddie (April 2001). "Striking Out". Los Angeles Magazine. p. 81. Retrieved 20 October 2011. ↑ "A new reality series reveals what it's like living with eco-celeb Ed Begley Jr". Grist. 2 January 2007. Retrieved 2010-03-13. ↑ "Anti-Defamation League Honors Extraordinary Women Including Studio City's Mayim Bialik". Studio City Patch. Patch. Retrieved 30 May 2012. ↑ Stephen M. Silverman (August 27, 2001). "Robert Blake's House on the Market". People Magazine. Retrieved 20 October 2011. ↑ "Clancy Brown's House". Virtual Globetrotting. Retrieved 2 September 2011. ↑ "Artists' Activities". Billboard. Aug 23, 1952. Retrieved 20 October 2011. ↑ "George Clooney's Home". Virtual Globetrotting. Retrieved 2009-10-08. ↑ "George Clooney and Elisabetta Canalis: Getting Serious". Retrieved 2009-10-08. ↑ "Gary Cole's House". Virtual Globetrotting. Retrieved 21 June 2010. ↑ Emily Shur (July 2009). "I'm a Runner: Jon Cryer". Stories From Real Runners. Runners World. Retrieved 24 October 2011. ↑ "Check Out Miley Cyrus' AWESOME New Home!". 3 August 2011. ↑ John Willis. Theatre World 1991-1992. p. 235. ISBN 978-1-55783-143-9. Retrieved 20 October 2011. ↑ Lauren Beale (August 8, 2011). "Yvonne de Carlo's former property in Studio City is sold". Los Angeles Times. Retrieved 20 October 2011. ↑ "Dutton and Wife Buy $1.5m home in Studio City, CA". Jet: 61. Nov 22, 1993. https://books.google.com/books?id=KrsDAAAAMBAJ&lpg=PA61&dq=%2Bdied%20%22home%20in%20Studio%20City%22&pg=PA61#v=onepage&q=+died%20%22home%20in%20Studio%20City%22&f=false. Retrieved 20 October 2011. ↑ "Zac Efron, The Hunky One, Talks About his Full Body Transformation". Studio City Patch. Patch. Retrieved 30 May 2012. ↑ CLAUDIA PUIG (December 5, 1993). "Retro : A New Road Taken : ERIK ESTRADA TAPS HIS LATINO ROOTS IN MEXICO CITY". Los Angeles Times. Retrieved 20 October 2011. ↑ Michelle Tan (May 26, 2008). "Is Selena Gomez... the Next Miley Cyrus?". People. Retrieved 17 September 2010. ↑ "DallasBlack.com: Interview: Meagan Good". DallasBlack.com. ↑ Kam Williams (January 20, 2009). "Meagan Good: The Unborn Interview". KamWilliams.com. Retrieved June 30, 2009. ↑ "Cuba Gooding Jr. Biography". The Biography Channel. AETN UK. Retrieved 20 October 2011. ↑ Mike Szymanski (1 Apr 2013). "Studio City Superstars Ryan Gosling and Mila Kunis Top Sexual Fantasies Poll". Patch. Retrieved 16 April 2013. ↑ Thomas, Kevin (February 8, 2004). "An eye trained on Welles". Los Angeles Times. Retrieved 20 October 2011. ↑ Lawrence Grobel (2010). The Art of the Interview: Lessons from a Master of the Craft. Three Rivers Press. p. 88. ISBN 978-0-307-51330-4. Retrieved 29 May 2013. ↑ Almendrala, Anna (22 March 2011). "Neil Patrick Harris Lists Studio City Home For $1.59 Million". Huffington Post. Retrieved 27 September 2011. ↑ "Vanessa Hudgens House in Studio City". Retrieved 22 January 2013. ↑ "HOT PROPERTY Actress Jennette McCurdy buys Studio City home". Los Angeles Times. Retrieved 12 July 2015. ↑ "Roddy McDowall : Biography". MSN Entertainment. MSN. Retrieved 20 October 2011. ↑ Olsen, Larry. "Kevin McKidd Interview". The Job Radio Show. Working Radio. Retrieved 30 May 2012. ↑ Mike Szymanski (2013). "'Argo' and 'Life of Pi' Win Most Academy Awards". Studio City Patch. Patch. Retrieved 16 Feb 2013. ↑ "Meet Alyssa Milano". Reading Eagle. November 18, 1990. Retrieved 20 October 2011. ↑ Mike Szymanski (17 December 2010). "Local Guy Bill Nye 'Resting Comfortably' After Collapse". Patch. Retrieved 27 September 2011. ↑ " "'90210' Star Jason Priestly Moves to Studio City After Selling Toluca Lake Home". Retrieved 26 September 2014. ↑ Ryon, Ruth (June 21, 1998). "Kramer Scoots Outta Studio City". Los Angeles Times. Retrieved 20 October 2011. ↑ " Mike Szymanski (2011). "Mason Shefa Wins Gold Medal in Art". Studio City Patch. Patch. Retrieved 4 September 2012. ↑ Mike Szymanski. "Closing Arguments End in Anna Nicole Smith Trial". Studio City Patch. Patch. Retrieved 20 July 2012. ↑ "News from California, the nation and world". latimes.com. ↑ Bobby Copeland (2009). B-Western Boot Hill: a final tribute to the cowboys and cowgirls who rode the Saturday matinee movie range. Empire Publishing. p. 135. ISBN 978-0-944019-28-3. ↑ "Bios - Alex Trebek". This is JEOPARDY! - Show Guide. Sony Pictures Digital Inc. Retrieved 17 September 2010. ↑ Willis, John (1993). Screen World 1993. Applause Books. p. 268. ISBN 978-1-55783-175-0. ↑ PETER KEEPNEWS (January 17, 2008). "Pete Candoli, Jazz Trumpeter, Dies at 84". New York Times. Retrieved 20 October 2011. ↑ "Morty Corb, 78, Jazz Bass Player". New York Times. January 17, 1996. Retrieved 20 October 2011. ↑ Stewart, Zan (October 25, 1989). "Musicians Set for Clare Fischer Tribute". Los Angeles Times. Retrieved 2013-05-05. ↑ Front Cover Jeannie G. Pool (2008). Peggy Gilbert and her all-girl band. Scarecrow Press. p. 136. ISBN 978-0-8108-6102-2. ↑ brent@special---offer.com, Brent David Freaney. "HAIM". haimtheband.com. ↑ Darlene Koldenhoven (2007). Tune Your Voice. TimeArt Publications. p. 94. ISBN 978-0-9789562-3-3. ↑ William D. Smith (2008). A Stroke of Luck. Rick Wilson. p. 162. ISBN 978-0615235653. Retrieved 16 April 2013. ↑ John R. Tumpak (2009). When swing was the thing: personality profiles of the big band era. Marquette Univ Pr. p. 227. ISBN 978-0-87462-024-5. ↑ Barry Monush (1995). Screen World 1995. Applause Books. p. 282. ISBN 978-1-55783-233-7. Retrieved 20 October 2011. ↑ Rosenblatt, Susannah (December 11, 2007). "Roads open in Studio City". Los Angeles Times. Retrieved 2010-02-23. ↑ "Obituaries". Hollywood Reporter. 28 Feb 2007. Retrieved 20 October 2011. ↑ "Pete Wentz Buys Rockin' New Pad in Studio City". Luxe Living blog. 7 May 2012. Retrieved 7 May 2012. ↑ Valli Herman (December 17, 2003). "Dweezil makes a brisket". Los Angeles Times. Retrieved 19 October 2011. ↑ "Frank Zappa, businessman". Los Angeles Times. 12 December 1989. Retrieved 1 October 2011. ↑ Beale, Lauren (April 10, 2013). "Zack Greinke buys Studio City compound for $4.6 million". Los Angeles Times. ↑ Laurie Champion (2002). Contemporary American women fiction writers: an A-to-Z guide. Greenwood. p. 114. ISBN 978-0-313-31627-2. Retrieved 20 October 2011. ↑ Norma Lee Browning (1976). Peter Hurkos: I have many lives. Doubleday. p. 27. ISBN 978-0-385-01508-0. ↑ "Los Angeles Public Library reference file" (PDF). ↑ "Harry Harrison, RIP. And Hollywood crumbles. – Chaos Manor – Jerry Pournelle". www.jerrypournelle.com. ↑ Donald Michael Kraig (2010). Modern Magick: Twelve Lessons in the High Magickal Arts. Llewellyn Worldwide. p. 80. ISBN 9780738728063. Retrieved 16 April 2013. ↑ Wharton, David (22 May 1992). "And the Question Is . . . : Will a Studio City Writer Top the 'Jeopardy!' Winnings Total Tonight?". Los Angeles Times. Retrieved 8 February 2014. ↑ SCHWADA, JOHN (11 April 1993). 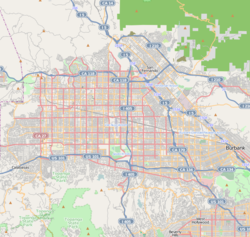 "Decision '93 / A Look at the Elections in Los Angeles County : Los Angeles Mayor : Separated from the pack by their public service, 11 candidates are given a fighting chance to win a runoff spot. : Joel Wachs : Focus on a Wide Political Horizon" – via LA Times. ↑ Heffter, Emily (June 30, 2014). "Jack Osbourne's New Home: High-Style, High-Security". Zillow.com. 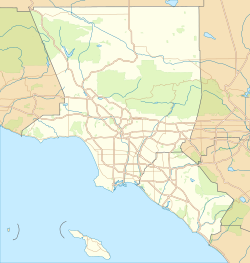 ↑ "Harvard-Westlake School". Retrieved May 19, 2007. ↑ "Studio City Branch Library." Los Angeles Public Library. Retrieved on March 19, 2010.